﻿ GraceHeim Pension, Sokcho-si | FROM $61 - SAVE ON AGODA! Have a question for GraceHeim Pension? 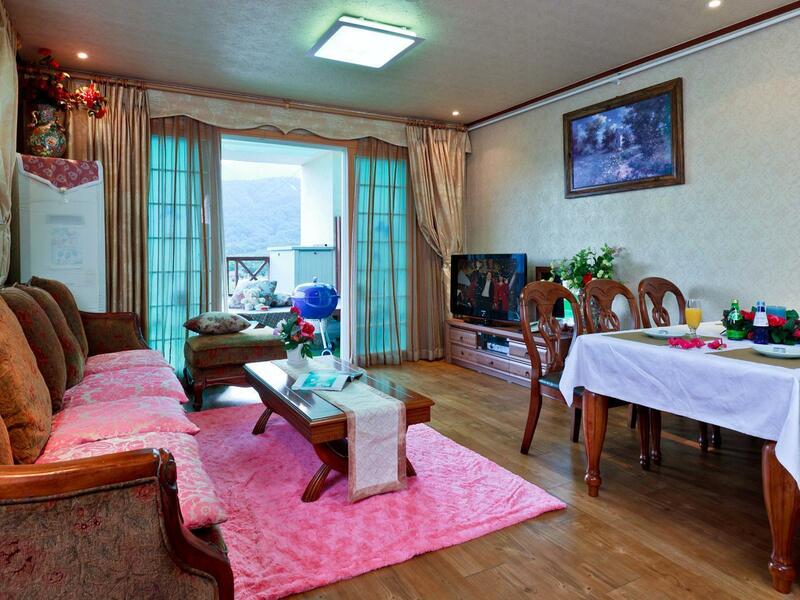 Ideal for fun and relaxation, GraceHeim Pension is located in the Seoraksan area of Sokcho-si. Set 4 Km from the excitement of the city, this 1-star hotel commands an excellent location and provides access to the city's biggest attractions. Also within easy reach are Seorak Waterpia, Seorak Cinerma, Choksan Spa World. At GraceHeim Pension, the excellent service and superior facilities make for an unforgettable stay. The hotel offers access to a vast array of services, including free Wi-Fi in all rooms, Wi-Fi in public areas, valet parking, car park, tours. 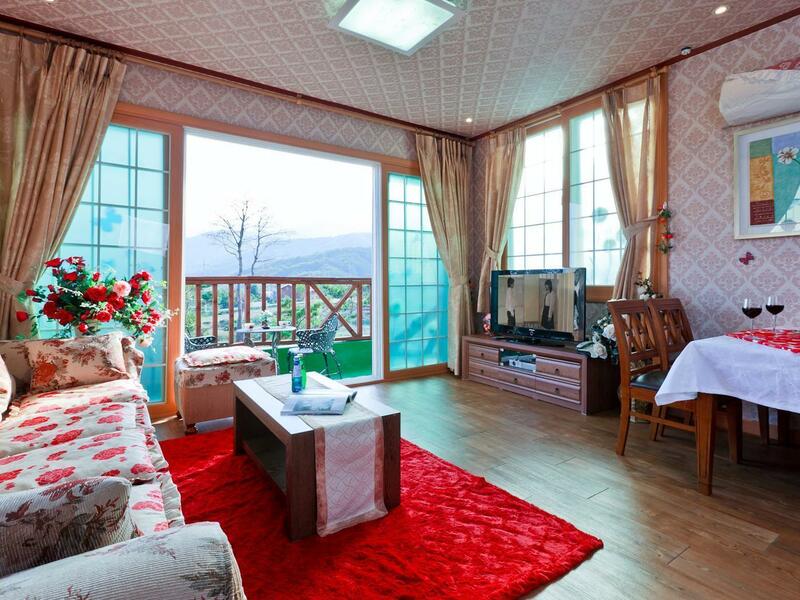 12 rooms spread over 3 floors provide a warm and pleasant home away from home. Modern comforts such as television LCD/plasma screen, internet access – wireless, internet access – wireless (complimentary), air conditioning, balcony/terrace can be found in selected rooms. Besides, the hotel's host of recreational offerings ensures you have plenty to do during your stay. 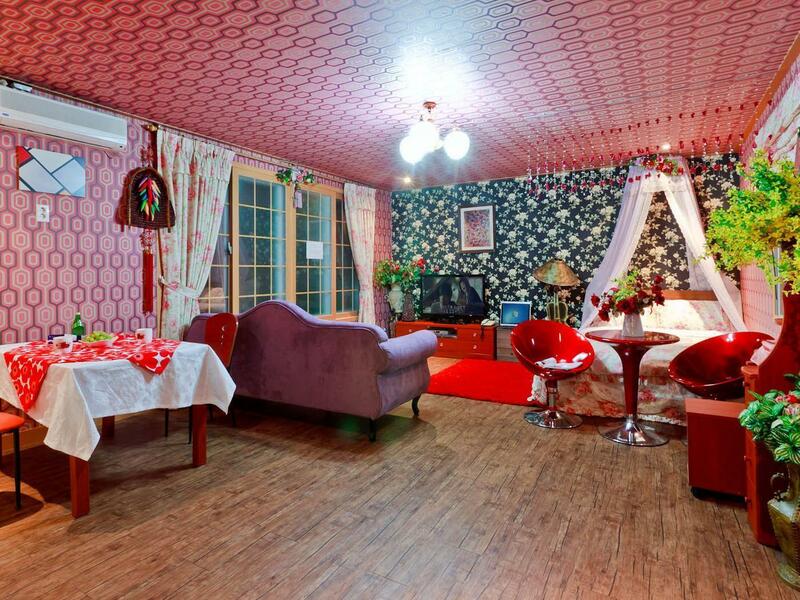 GraceHeim Pension is an ideal place of stay for travelers seeking charm, comfort and convenience in Sokcho-si. My family and I truly enjoyed staying in the hotel. The staff was friendly. No food to eat at hotel, but that was fine, there were other great restaurants I stumble across. Nice hotel, good staff, private location. Grace Heim was nice. The staff spoke English and on night there were only two families in the entire facility. It was clean, but the beds are quite firm. In general I was very satisfied. The view, the room, the grill! Overall we had a very nice stay at GraceHeim. It is not a hotel, rather a pension or large house with many big private rooms. The owner and his family live on the first floor and he spoke English very well to help us out. There is not much around the pension - so best if you bring in all your own food. I did a Costco run in Seoul and bought a ton of stuff for grilling, and our balcony had a Weber grill. For 20,000 KRW the owner got a charcoal fire going for us each night and we grilled and enjoyed the beautiful view of Seoraksan Mountain from the deck. Or tried to...(see below). On the first floor their is a big pool table and a chess board and a microwave so you can really just camp at the pension and enjoy. There are a couple of beat up bikes out front too - my daughter and I jumped on the bike built for two and tooled around a bit. The only problem, which is no fault of the hotel, is that the wind picked up right after we started the grill. The temperature dropped like 25 degrees and for the next two days we had gale force winds whipping around us. The first night around 4AM the wind ripped part of the roof off and despite the owner's best efforts to fix it, it slammed up and down waking up the whole hotel. Unfortunately the cable car and Seorak was closed due to the wind as well. The other thing is that we went on a Korean holiday weekend and there were a bunch of other groups staying there - with like 20 people in a room. They were having a good time for sure - but my parents who are in their 60s - weren't really happy about all the noise. Gotta take it all in stride - overall a really good stay. This hotel would be an excellent choice for a romantic getaway for couples with a car. Unfortunately, I was a male traveling alone (so the decor was a bit too "cute" for me), and I did not have a car (so the location was a bit remote and not convenient to reach by public transport). However, the room was large and comfortable and owner was extremely helpful - even giving me a lift to the bus station at the end of my stay. Our duplex room was very spacious, lovely mountain views from the balcony and very peaceful. The GraceHeim Pension is an excellent pension in a brilliant location. To start, the rooms are phenomenal. Two levels, high ceilings, fully equipped, and an excellent balcony. The location itself is in a remote, calm location, yet close enough to all the attractions via car / taxi. The staff were very friendly and catered to all of our needs. In addition, GraceHeim is dog friendly, as I brought my dog along for the trip. I could not have had a better stay anywhere else. This has been by far the best pension I have stayed at in Korea. I went with a group of 10 people, we occupied three duplex rooms, and couldn't be happier with the experience we had! The back decks off of the rooms served as a great place for playing cards, having drinks, and just relaxing. When we wanted to grill out we just had to let them know and they provided charcoal service for 20,000 won (about $20.00). You could use the grill either on your back deck or in an open grilling area with picnic tables. With such a large group we opted for the open area. One of the nights it rained, so we were directed to another area with covering behind the main building. The pool was also wonderful, a rare find at Korean pensions! The pension is about an 8,000 won (about $8.00) cab ride from the park entrance as well as from the beach, and they will call a cab for you. The duplex rooms are well maintained and the kitchens provided everything you need to cook. There is one bed in the upstairs of the room and one floor mat and duvet is also provided. 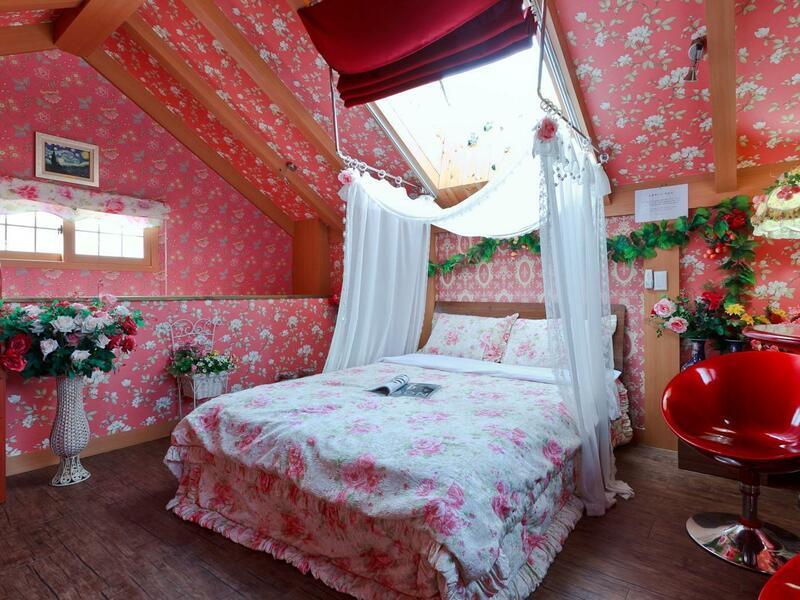 If you want, you can order another floor mat and duvet for an extra 10,000 won (about $10.00) a night. We brought all of our food and drinks with us because it was easier and it was over Chuseok, so we weren't sure what would be open. There is a GS mart about a 15 minute walk and there are also some restaurants near the GS mart. I would recommend bringing your own food and BBQ because they provide such a great place to have a cookout! My friends and I will definitely be going back to GraceHeim Pension! Great stay with friends. The kitchenette allowed us to prepare our own food which helped us save money on the trip. The rooms are huge, and the staff are fantastic. We will be coming back to GraceHeim. Overall a good stay. The deluxe room was big with a kitchenette, wifi, cable tv and great views of the mountain and garden. The room it self is decorated a little different, but it was a fun place. Charles and his family run the hotel, and he was very helpful in helping us order in food, call for taxis and even offered to take us to town on different occasions. 대체적으로 청결한 편이었으나 침구에는 얼룩이 심했으며 중앙 난방이어서 저희가 묵을때에는 조금 추웠습니다. 그리고 전체적으로 꽃무늬가 너무 많아 산만스러워 편안한 느낌이 없었습니다. 가격대비 훌륭한 펜션. 2인실에 1박 했었는데, 복층 구조의 넓은 방이 인상이 깊었고, 테라스에서의 바베큐 시설은 물론 뒤뜰에서도 시설이 있어 가족 및 친구들과 함께하기 좋은 펜션. 다만 중앙집중식 난방때문인지 늦가을이나 겨울에는 추울 수 있음.